You can navigate the Visualization by clicking on the icons at the bottom ( ). The pool game is currently only available in German. 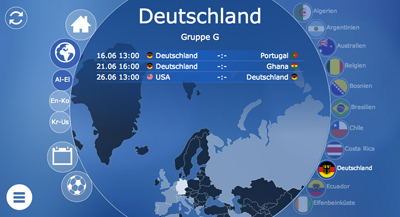 Rasenball is an interactive visualization of the match table for the Soccer World Cup 2014. Through the main menu you can choose the kind of information to display. The fields in the stadium ring represent the teams, the days, the groups or the stadiums. Hover over any of the fields to get further information. By clicking on a field, the selection will remain selected even when choosing another section in the main menu. The mobile version can be viewed with any mobile device on the same URL. Alternatively you can directly visit rasenball.com/mobile_en.html. If you enjoy Rasenball, we would be happy if you liked us on facebook. Your Timezone has been detected as CEST. Right now it is . All match times will be relative to this time. Interessested in further information. Feel free to contact us. We are sorry, but the game is only available in German. Your screen resolution is not supported. You can either change the size of your browser window or switch to our mobile version. We are sorry. This site only works in IE10 or better.